Jim’s starter bike, a 90cc Honda street bike was “borrowed” from his brother in 1966. The following year he began competing on an 80cc Suzuki. Later that year Jim moved up to a 250 and realized his first win in the Production Class. 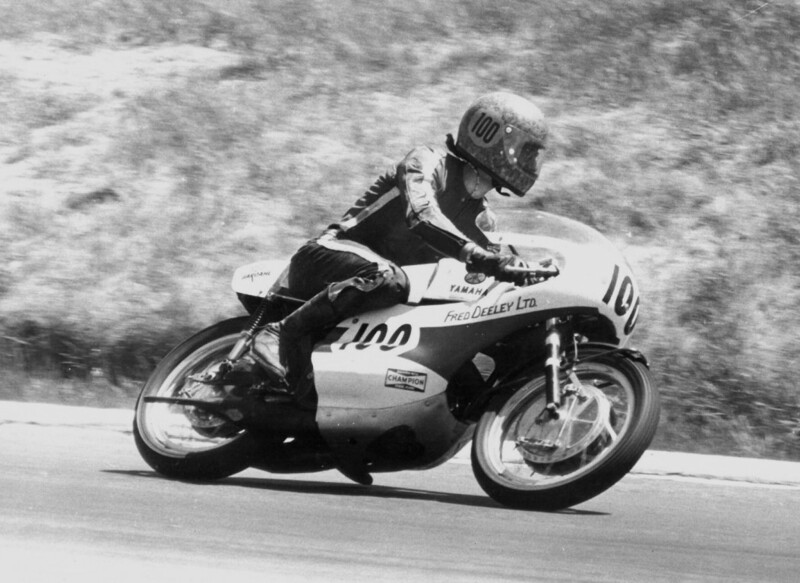 By 1968, Jim had converted the 250cc Suzuki into a racer and won the Canadian Senior Championship. He also production-raced the first 500cc 2-stroke Suzuki road bike in Eastern Canada, frequently beating the favoured Triumph and BSA 750cc triples of the day. 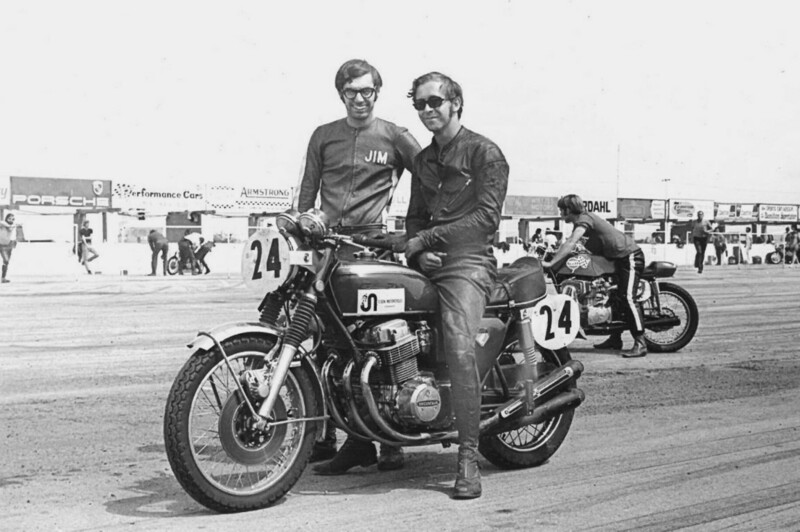 The Canadian Suzuki Distributor offered Jim a full sponsorship in 1969 and provided his first real factory racing bikes, a TR250 racer and later in the year, a TR500 racer, one of only five in North America at the time. These bikes enabled Jim to win the 250cc and 500cc Ontario Provincial Championships and finish the season as the #2-ranked rider in Canada. 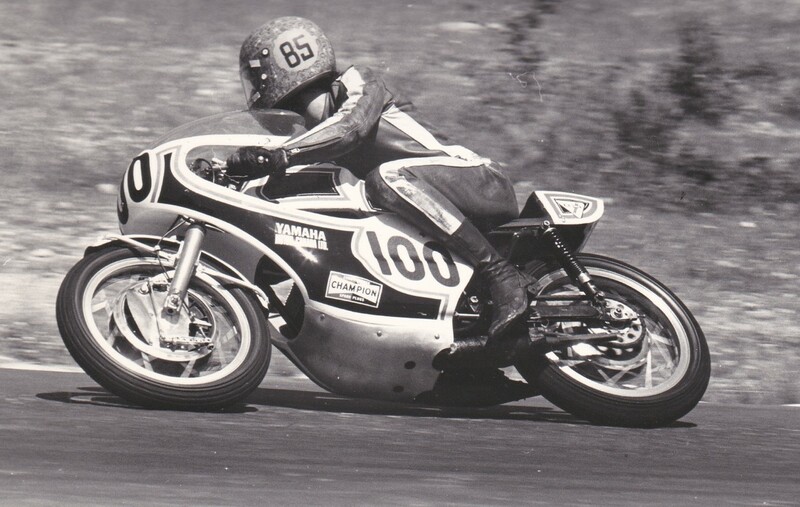 Jim continued his winning streak over the next couple of years, breaking track records and chalking up wins at Harewood, St. Croix, PQ, Westwood, Sanair and a BEMC Indian headdress at Mosport running Deeley Yamahas and in 1972, Suzukis tuned by Ken Rosevear. 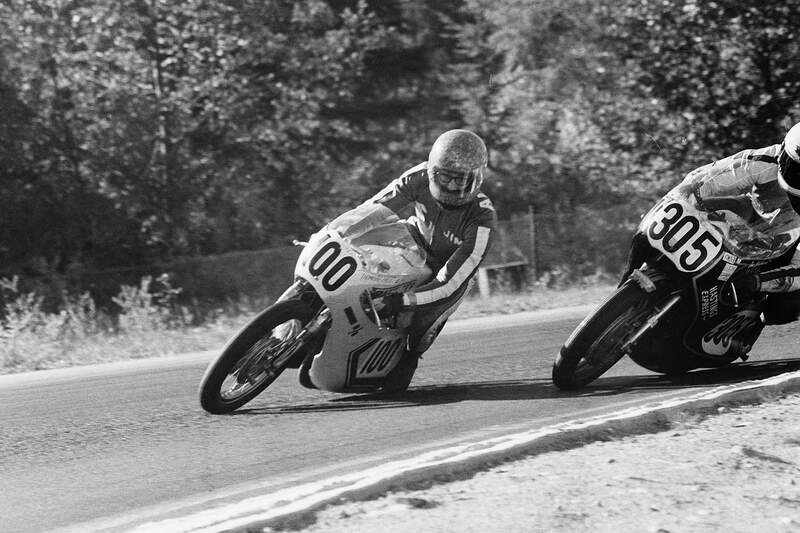 Jim raced extensively throughout Canada and the US on Yamaha 250cc and 750cc racers in 1977 and was undefeated in Canadian National races winning the Canadian Championship with a perfect score and earning the #1 plate once again. In mid-1978, Jim left racing for a brief career in construction. Within months, an ad for a “Dunlop tyre tester” caught his eye. Offered the job and just a few days to consider the move, the decision was made easy when the benefits of roofing a house in the snow were weighed against the warmth of an indoor office. In January of 1979, Jim began working for Dunlop. His first outing for Dunlop was a low-key trip to Daytona. None of the tire companies were deeply involved at this time, but as racing evolved, Dunlop looked to establish a presence at AMA races. With Jim’s background, that responsibility fell on his desk. The company’s presence grew with the rise of the Superbike class in the 80’s and took off when Supersport racing brought DOT legal street tires onto the track (1987). As Manager of Dunlop’s USA Road Racing program, Jim worked with tire engineers, designers and race teams the world over, coordinating production facilities in several countries and guiding race-tire retailers across the country. 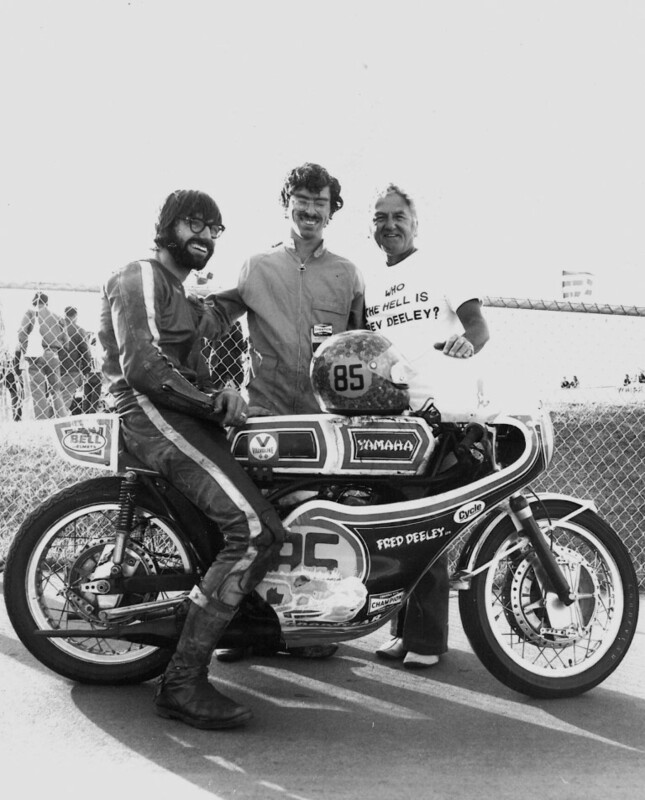 From 1979 to 2010, Allen was Dunlop’s man at the track in the USA, supplying tires and technical tips to hundreds of Dunlop riders. Future American World Champions Kenny Roberts Sr., Kenny Roberts Jr., Wayne Rainey, Eddie Lawson, Kevin Schwantz, Nicky Hayden, John Kocinski, Fred Merkel, Doug Polen, Scott Russell and Colin Edwards all worked with Jim and used Dunlop tires in AMA competition before moving on to Europe and their World Championships. In addition, Dunlop’s high-profile customers, Honda America Corporation, Suzuki Motor Corporation USA, Yamaha Motor Corporation USA, Kawasaki Motor Corporation USA, Harley-Davidson Motor Corporation and Ducati Motors USA all received personal attention. Under Allen’s 31-year tutelage, Dunlop won more than 125 AMA Road Racing Championships, including 26 Superbike Championships, 24 – 600cc Supersport Championships, 15 – 750cc Supersport Championships, 19 – 250cc GP Championships and 11 Formula Extreme Championships. Throughout his career, Allen was in constant motion at the track, making the rounds of the factory teams and privateer riders alike in order to gain a better understanding of tire performance. The insider information picked up from factory riders and tuners went no further than his clipboard as he balanced the tricky relationships between riders, OEM Factory Teams and competing tire companies. The fact that he kept the trust of so many teams and riders for so many years is proof of his discretion. During his years on the job, Jim Allen WAS Dunlop! 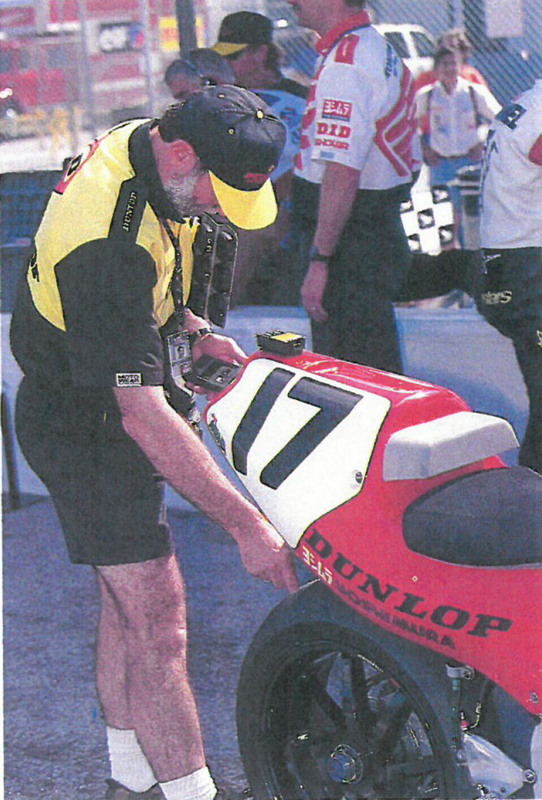 Jim Allen retired twice from racing – once as a rider in 1978 and again as Dunlop’s Senior Road Race Manager in 2010. 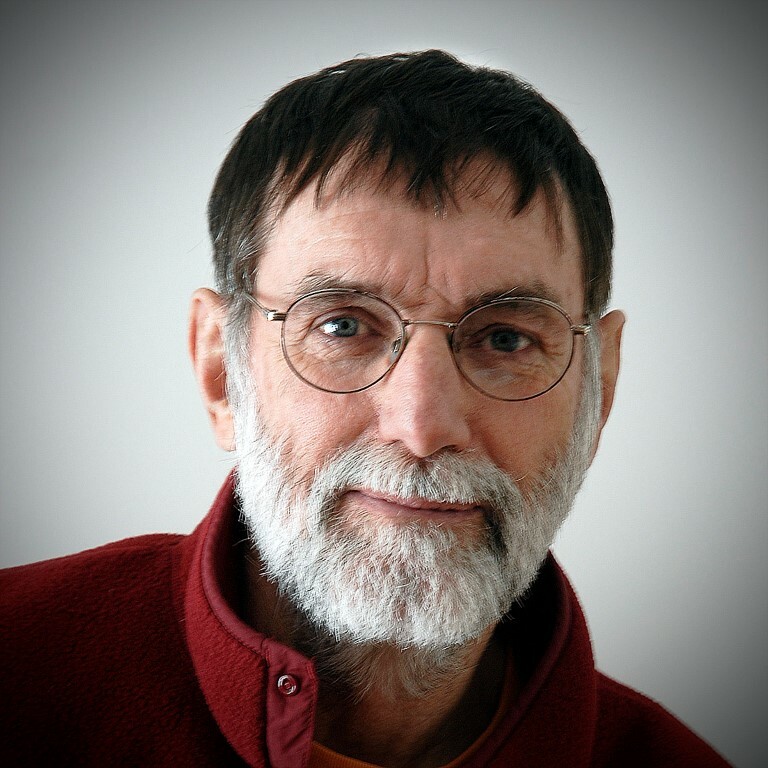 We welcome Jim Allen into the Canadian Motorcycle Hall of Fame.